Designed for dairy milking, on a small scale. Our portable bucket milking systems are ideal for milking the occasional animal in as much as they are ideal as a daily milker for small herds. Together with the correct liners and claw-piece, the system is compatible with goat, sheep, and cow dairy milking. 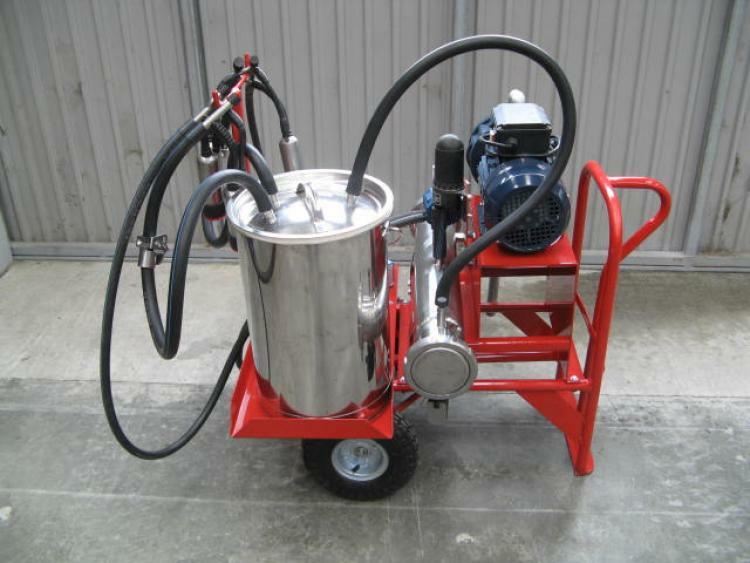 Portable milkers are also useful for farmers who run large scale dairy operations. In particular, with one or two cows early in calving it provides an economical alternative to running a single cow or two through a full sized system and then having to do a full wash. The entire dual bucket milking system weighs just 73 kg. Yet, despite its lightweight design, it is also sturdy. In the event of an accidental kick or bump, its tubular steel frame ensures that all components stay put. Bumpy terrain is no barrier either, due to its large 250 mm pneumatic wheels. Cluster pulsation is simultaneous (4 x 0). Pulsation rate is between 45 to 180 pulses per minute (depending on pulsator). This gives the machine sufficient flexibility to be adapted to large and small ruminant dairying. For instance, with cows the recommended pulse rate is 55 pulses per minute. But for goats and sheep, respectively, the recommended pulse rates are 70-90 and 120-180 pulses per minute. The pulse ratio by default is 60 % for vacuum on phases (increasing and maximum phases) and 40 % for vacuum off phases (decreasing and minimum). Even so, anywhere from 60:40 to 70:30 can be set, which is ideal for goats (65:35) and sheep (50:50). Available in two versions. We offer the system as a single milker with a single receiver and cluster, perfect for milking the occasional animal. 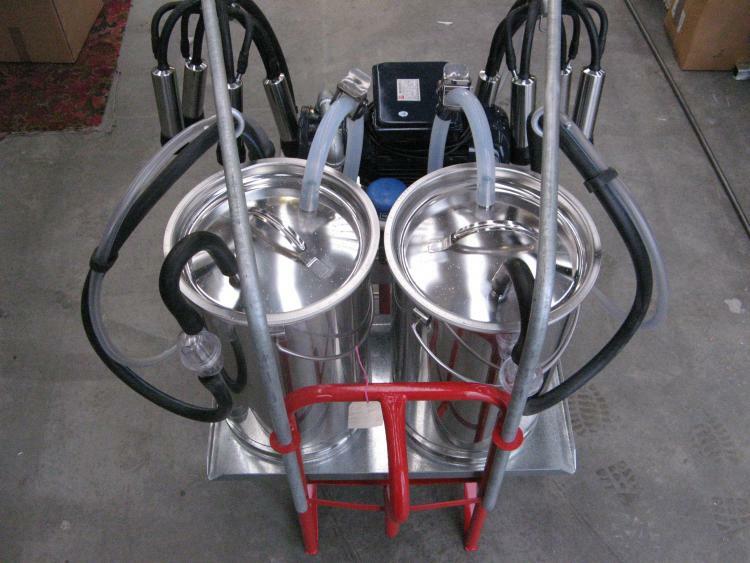 Or, for more regular milking we also offer it as a dual milker, with two receivers and two clusters. 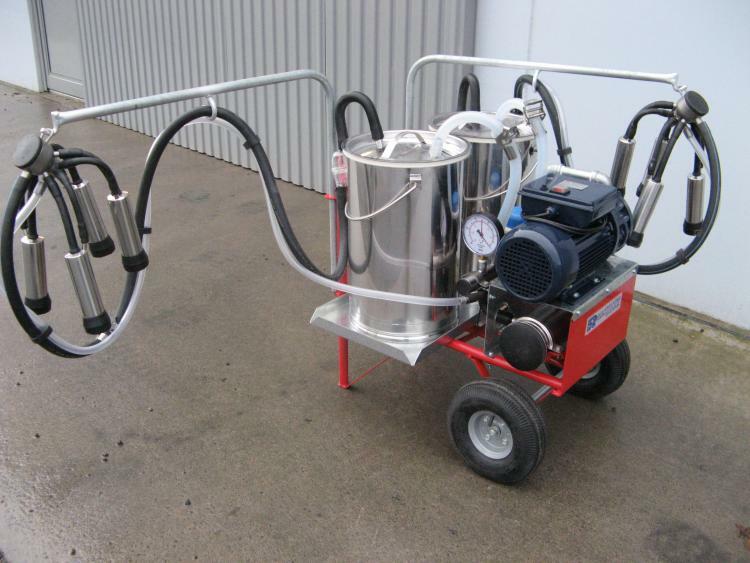 The vacuum pump supplied with our portable milker is a fixed displacement rotary vane pump. This uses four carbon graphite vanes that operate in an eccentric orbit around a circular rotator inside the pump cavity. For the purpose of having a lubrication-free pump, the vanes wear down over time by design. Usually 2 to 3 years is the expected service life before needing replacement vanes, assuming twice daily use every day. Driving the pump is a single phase 240 VAC 0.75 kW motor. Together with the motor, the pump is able to generate 180 L/min airflow at 50 KPa. To adapt vacuum levels to sheep and goats, a regulator provides a simple means of adjustment down to as 32 kPa.